Brooch Panther. 2017. 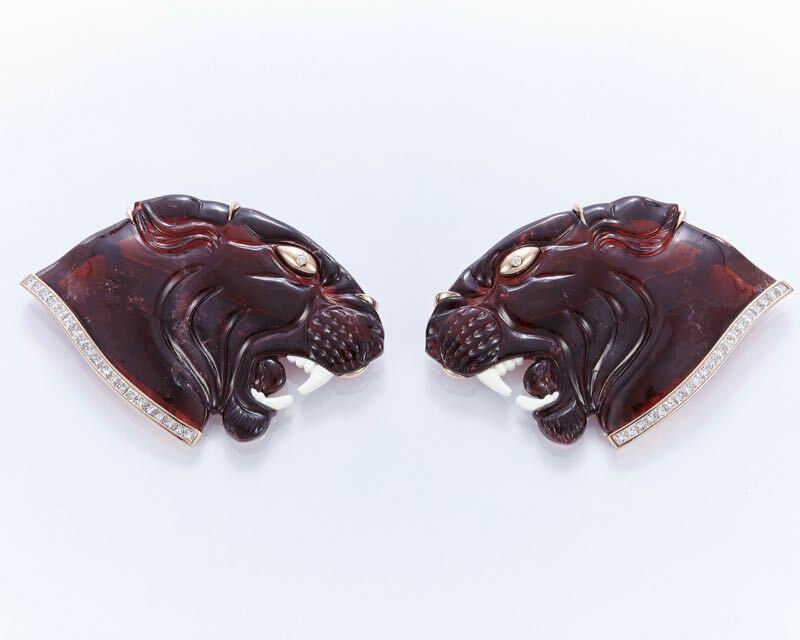 Panther heads in pink tourmaline hand-carved by a German master sculptor from Idar-Oberstein and mounted in 18 Karat white gold and set with diamonds. Design and creation by Tevin Baechtold Création Cadeaux. Tevin explores ideas, symbolisms and values through the medium jewelry working with unusual gemstones creating one-of-a-kind collectors pieces or variations with uniquely different features. Tevin trained as a goldsmith in the ateliers of Evert Hofacker in Germany where CADEAUX JEWELRY began in 1975. He graduated from Idar-Oberstein Germany and now is designer and production manager for CADEAUX JEWELRY. The Panther (pantera, pantere) occurs in ancient legends and jewelry, going back to ancient Egypt and the Greeks who thought the panther the animal Dionysus favoured to ride. The panther was also used in South and Central American cultures where it was associated with the sun and solar vibrancy. It also occurs in German heraldry. As a totem the panther is believed to be a fierce and aggressive guardian and a symbol of courage and power.